Researchers from Israel's Bar Ilan University and New York University designed a six-state magnetic element - which could be used to create a magnetic memory device with six-states - and thus a higher density than a the regular 2-state device. The researchers say that multi-level MRAM cells based on this design should not suffer from low writing speed and high power consumption - problems that are common in multi-level Flash memory cells. 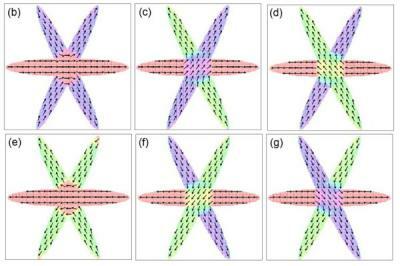 The multi-level magnetic element was achieved by arranging the magnetic film into a pattern of three crossing ellipses. In the overlap region there are six different stable magnetic orientations. These can be controlled using spin-orbit torque switching.